Why having your own list is essential to your business. Knowing these facts will give you an advantage over the majority of online marketers who are doing it the wrong way. The bare essentials you need to get started building a list of thousands. Inside I reveal the sites and tools I use to build my list. How to write and design your "squeeze page" for maximum results. Use these special tactics to get as much of your site visitors to opt-in to your squeeze page. Psychological triggers that'll make your offer irresistible to your site visitors. You'll discover the most effective words that get maximum results. Why you should stress out the benefits, not the features of your offer. How to write a powerful, captivating headline that will surely get the attention of your visitors. Examples of squeeze pages and landing pages with the right elements. How to get heavy traffic to your squeeze page so you can build a list of thousands. Here are some tactics for getting people to your site. How to milk your list for everything it's worth. Building your list is one thing, and making money from it is another. Here are BIG ways to squeeze as much cash from every subscriber. 10 different types of content you can send out to your list that always works. Running out of ideas on what to end out? Here are 10 content types. 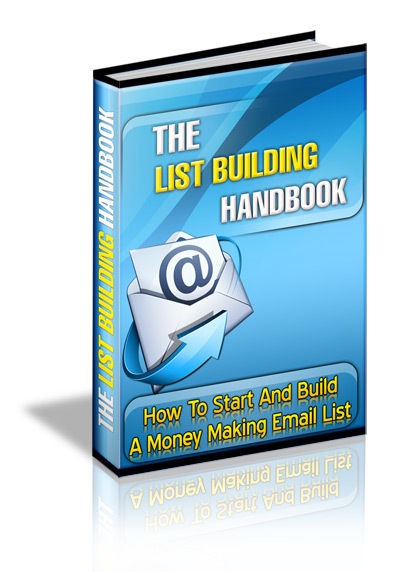 The List Building Handbook MRR email lists;ezines;money;the list building handbook 99105655 2.97 digitteam Fresh Download Available!